The balloon pilots returning to Angola this year are some of the country's finest pilots and will be competing for cash and prizes in this annual invitational while they fill the sky with their dazzling display of colorful balloons. Other entertainment for 2016 will include remote controlled aerial displays, Kid's Fun Zone, helicopter rides, skydiving, classic car show and lots more food and retail vendors. Weather conditions permitting, there will be launches on Friday and Saturday mornings and evenings, with night time illuminations scheduled on both Friday and Saturday evenings. Balloons Aloft will be highlighting special shaped balloons in the 2016 lineup, paid balloon and tether rides by Gentle Breeze Hot Air Balloons and a Classic Car Display. 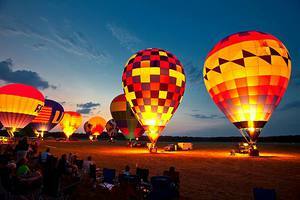 Balloons Aloft will also be featuring Indiana's Bicentennial celebration and will have evening musical entertainment. Reminder: like all ballooning events, ballooning and all other events are weather dependent and the safety of our pilots, volunteers, and all spectators is our primary concern! Like a pilot says: "You would rather be on the ground then in the air wishing that you were on the ground." US-20 towards Angola. Turn right onto US-20 East/ West Maumee St. At the traffic circle, take the 2nd exit onto East Maumee St. Turn Right onto S 100 East/ John McBride Ave School on right. Head east on US-20 E. At the traffic circle, take the 2nd exit onto E Maumee St. Turn right onto S 100 E/John McBride Ave, School on right. Head on US-20 W. Turn left onto S 100 E/John McBride Ave, School on right. Head south on I-69 S, Take exit 350 for North 200 West. Turn left onto N 200 W. Continue onto N Gerald Lett Ave. Turn left onto W Maumee St and at the traffic circle, take the 2nd exit onto E Maumee St. Turn right onto S 100 E/John McBride Ave, school on right.